Good Choice Reading: Halloween Booktacular!!! Trick or Treat! Well, almost...we're only 15 days away from Halloween!! Are you excited? We are! And to share our excitement, Good Choice Reading has teamed up with SIX other bloggers to bring you an awesome BOOKTACULAR event!!! 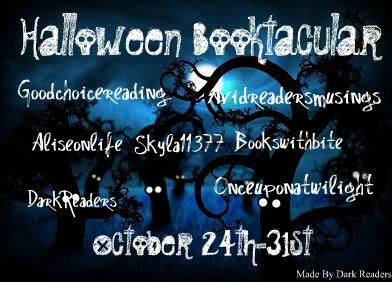 Halloween Booktacular kicks off on October 24Th and ends October 31st :-). It's going to be BOOKTACULAR!